Out-of-the-box, you can provide RA with a list of possible values for any given enum field and it will create a <select> element with those values as options, then transform it into a combobox widget. When the enum field is part of a nested has_many association form, the <select> element and options are drawn once in a hidden “blueprint” <div> which is then copied for each new associated object you add. In other words, the enum values are evaluated once at runtime, and that’s that. What I needed was for these two enum fields to be linked, with the options available in the select lists of the children to be dependent on the selected value of the select list in the parent, and to do it dynamically. 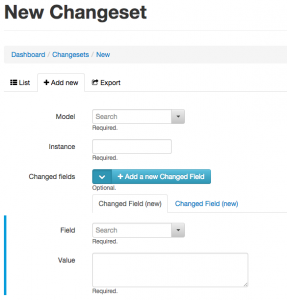 updateAttributes accepts one argument, selects, which defaults to all of the nested Change#field fields in the form. We setup a couple events so that it will be called anytime either of the two enum fields’ value changes. When it is called it fires off an AJAX request to our new controller method and sets up a promise to to be run if the AJAX request completes successfully. When that happens it iterates over the array of valid field values that were returned and creates new <option> tags for each of them. Finally there’s a pretty long chain of function calls that: destroys the existing filteredSelect widget, finds and then removes all of the current <option> tags in the select except for the first one (it’s an empty option), appends the new <option> elements, creates a new filteredSelect widget (which picks up the new options), and sets the selected value to whatever was selected before. The two change event triggers handle a couple different scenarios. The first case is if the Changeset#model field changes, in which case we update all existing nested Change#field <select> elements. The second case is when RA’s custom nested:fieldAdded event is triggered after a new nested association fieldset is generated (i.e. 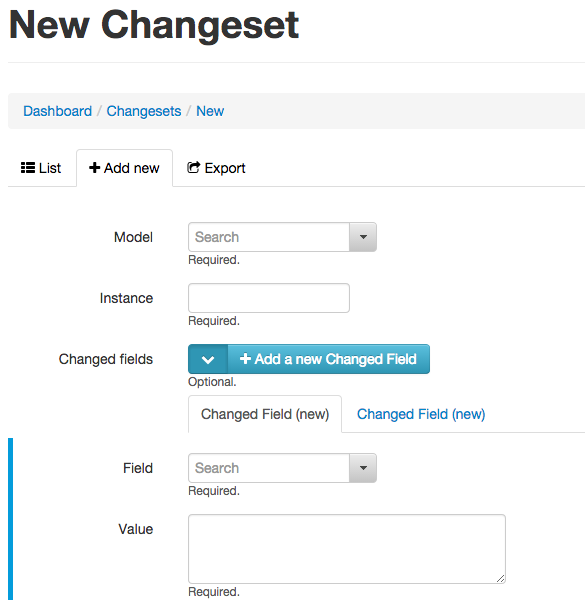 after the “Add a new Changed Field” button is pressed), and we update only that new Change#field field. Perhaps this could be spun off into a new custom field type for RailsAdmin at some point. For now, I’m just happy it works for this particular project. This entry was posted by Chris Bloom on September 4, 2014 at 1:50 am, and is filed under Code Snippets, Programming. Follow any responses to this post through RSS 2.0. You can leave a response or trackback from your own site. I have a doubt in my project have 3 models, which relate, which are sales, sales_product and product, the model sales_product have a valor_unitario field, and the valor_unitario I want to receive already in the product model. how do this in rails admin? just wanted to give you huge kudos for posting this. Being new to rails_admin, these kind of things can even halt the development process and while reading RA source code is immensely helpful, sometimes it's not enough and input from other developers like this article is just invaluable. Thank you! Glad you found it useful, Dmitry!